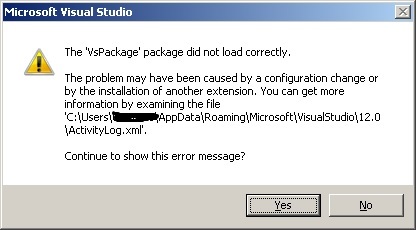 I'm having this error pop up once I start Visual Studio professional 2013 with update 3. I don't know whats going on and also when I created a web form and try to put items from the toolbox into a table in my code it doesn't let me. the items are dim and can't select them any more. before I would make a table and try to add Labels, textbox, etc and it wasn't a problem. Visual Studio 2013 Update 4 Tools -> Extensions and Updates Disabled "Release Management for Visual Studio 2013 v2.1". I got the same issue today, but the error message should be giving you some guidance. Take a look at mine, it tells me to check the "ActivityLog.xml" for more information. After looking at the entry my error showed me that it ocured the evening before around 5:30pm and I know I was installing the Visual Studio 2013 Update 4 at this time. So it seems I had a problem with my Update installation. So I realized my problem was an install issue I created, yours might be an add-on or something similar that you just updated your Visual Studio with that corrupted your VS. So a little more researching and asking some buddies at work and we tried doing this step in another SO article, which should have the same effect of fixing our package loading problem also. the Provider package did not load. After running the steps listed there my Visual Studio started up without any obvious issue. Hope this helps. Open ActivityLog.xml in a viewer (I've used Microsoft Edge) and you'll find the error. VSPackage is the "Developer Analytics Tools" extension for me. The error is gone after uninstalling that package. You can obtain the package and attempt to reinstall from the Developer Analytics Tools page in the Visual Studio Gallery. I uninstalled and reinstalled Visual Studio and the problem went away for a little bit. It eventually came back complaining about different packages. Then I noticed my home directory was encrypted. I decrypted the directory and the problem went away. If it is not an encryption issue, I'd try just uninstalling and reinstalling VS 2013. Message could be shown in case of "Path" environment variable longer than 2048 characters. In that case, system doesn't work proply with system paths like %windir%. If it's your case, shorten "Path" environment variable and everything works again. Not the answer you're looking for? Browse other questions tagged visual-studio-2013 vspackage or ask your own question.